Mount Pleasant Corporate Center is the gateway to downtown Scranton. A city revitalized, Scranton is a growing community offering a vibrant downtown with a pro-business environment. Strategically positioned along 7th Avenue and West Linden Street, park tenants enjoy ample parking, immediate highway access and corporate visibility from the North Scranton Expressway. One of one of Scranton’s two main thoroughfares into the city, the North Scranton Expressway is traveled by more than 8,000 vehicles daily. Development of Mount Pleasant Corporate Center began in 2008 with the acquisition of the property by The Scranton Lackawanna Industrial Building Company (SLIBCO). The park features fully-improved commercial and office sites. Currently, the park is home to Geisinger Health Systems and Mount Pleasant Medical & Professional Center. Mount Pleasant Corporate Center is located within a Keystone Innovation Zone (KIZ). For-profit businesses located within Mount Pleasant Corporate Center, that are less than eight years old and operating within targeted industries are eligible for a tax credit through the KIZ program. Mount Pleasant Corporate Center includes five building lots on 23 acres of redeveloped land. During development, the Scranton Lackawanna Industrial Building Company constructed utilities within the roadway to accommodate office and commercial business use. Developers will experience reduced construction costs, as utilities will only need to be extended from the roadway to the site. 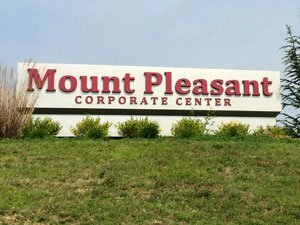 Mount Pleasant Corporate Center is served by PPL Electric Utilities via a 3 phase, 12 volt, 600 amp overhead service. The park is served by UGI via a 4” main which connects into an 8” line in West Linden Street. The park is served by an 8” line which connects into a 60” interceptor line, owned by the Scranton Sewer Authority. Telecommunications service is provided by Verizon Comcast and Frontier Communications. In addition the park offers wireless telecommunication service via the Lackawanna County Wireless Initiative. This service is a quick and cost-effective connectivity readily available as an advantage for business and economic development throughout Lackawanna County. PA American Water Company services the park via an 8” main.